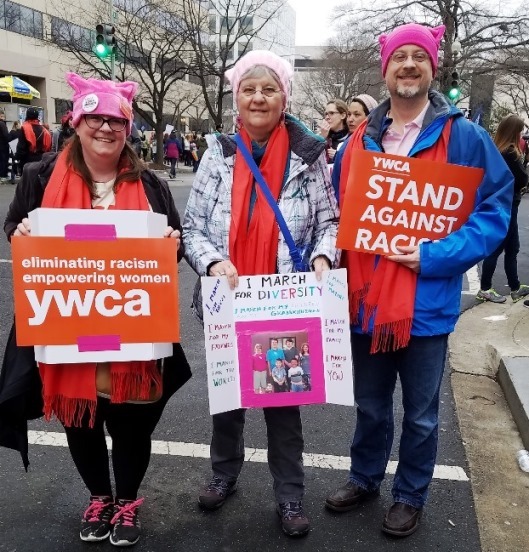 In honor of Women’s History Month, YWCA staff member Angie Burnside shares her reflections on making history by being part of the Women’s March on Washington. I first became aware of the idea for a Women’s March on Washington D.C. not long after the election. And, I felt strongly compelled to be there and to take a stand for my individual rights as a womxn. As a nation, we needed to march against the horrific rhetoric during the campaign that normalized sexual assault and demoralized womxn everywhere. Rhetoric that blatantly articulated racism, xenophobia, and hate. As a YWCA staff member, I felt very strongly that our work – eliminating racism, empowering women – had become even more crucial given the blatant racist and fear-based stereotyping that had been so prevalent in the months leading up to the election. 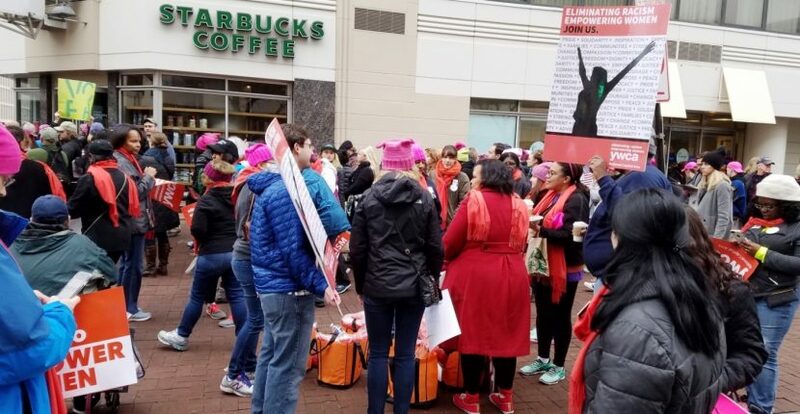 I wanted to march as a womxn and stand alongside feminists, their supporters and allies. 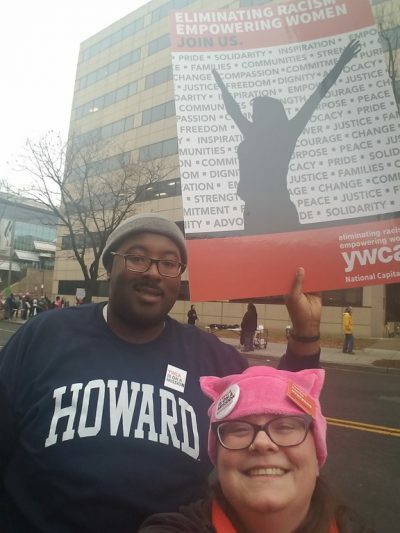 I also felt that marching as a representative of YWCA and for our mission was even more powerful. When I arrived in Washington D.C., I was amazed at the diverse gathering of people who all stood together in solidarity. The energy that pulsed throughout the city, particularly in the Capital Mall area, was palpable and felt raw. On the morning of the march, I met up with the YWCA group and felt so empowered to be with them – to be with other YWCA staff and supporters who are also carrying out the work of YWCA in their communities. I met YWCA staff from all over the East Coast, Mid-West, and even a few from the Western US, though I had the distinction of traveling the farthest! We had some good, good conversations – mostly about how we could best serve our own local communities. As the morning wore on, we began to realize that the huge number of marchers was much, much greater than the organizers anticipated. Later estimates showed that there were one million of us there. As we made our slow progress towards the White House, I felt both excited and also really weighed down by the enormity of what lies ahead. Although this time of solidarity was impactful and visible, I was also feeling anxious about how we were going to keep the momentum going. How could we keep on and not lose our energy and focus on the important issues that would arise with the new POTUS and his administration? For me, this march wasn’t “just another protest.” It felt like a stake in the ground, a statement of how many of us would keep on and do the hard work to come. This is easy to do. Take one action every 10 days. There are tons of resources on this website. Also very easy to do. Take action to end racial profiling, protect affordable health care and advocate for paid family and medical leave. Take action to increase affordable housing, workplace protections, paid family and medical leave and more. Maybe you would like to do some voter registration in late summer or early fall? Check back here to find out how. There are many ways to participate. Together, we can make a difference and stand against injustice.